Spectators in the foreground watch as Atlantis launches on its final flight, July 8, 2011. This year was quite an eventful one in spaceflight, with many vessels launching toward the heavens — and a few crashing back to Earth. The sky wasn't really falling in autumn 2011; it just seemed that way, with two defunct satellites plummeting to Earth out of control within a month of each other. First came NASA's Upper Atmosphere Research Satellite, or UARS. This 6.5-ton climate satellite, which was about the size of a school bus, launched in 1991 and was decommissioned in 2005. UARS then spent six years spiraling slowly toward our planet, finally plunging into the atmosphere above the Pacific Ocean Sept. 24. Germany's 2.7-ton Roentgen Satellite, or ROSAT, followed closely on UARS' heels. This craft, which launched in 1990 to survey the heavens in X-rays and was shut down in 1999, fell back to Earth over the Indian Ocean Oct. 23. This year also saw the last flight of an American icon. NASA's storied space shuttle program came to an end after 30 years of service when Atlantis touched down shortly before dawn July 21. Atlantis' flight was the 135th space mission for the shuttle program, which began to take shape in 1972 and first launched to orbit in 1981. The shuttle accomplished a great deal during its long lifetime, helping to build the International Space Station and making spaceflight more routine than it had been. The three remaining space-flown orbiters are now being prepped for display in museums. For now, NASA is dependent on Russian Soyuz vehicles to ferry its astronauts to and from low-Earth orbit. However, the agency hopes private companies can take over this orbital taxi service by 2017 or so. And China won't rest on its laurels for long. The nation plans to launch two more docking missions during 2012, at least one of which will be manned. Yuri Gagarin became the first person in space April 12, 1961, completing one Earth orbit in his tiny Vostok capsule before returning safely to terra firma less than two hours later. The United States launched its first spaceflyer just weeks later, sending Alan Shepard on a short suborbital flight May 5. And the anniversaries didn't stop there. On May 25, 1961, President John F. Kennedy made the speech that charted NASA's direction for years to come, announcing that the United States would put an astronaut on the moon before the end of the decade. So while our future may be in the stars, this year spurred many spaceflight experts and observers to cast their gaze back through history. The tragedy reverberated beyond Arizona and the halls of Congress, reaching into low-Earth orbit. Giffords' husband, Mark Kelly, was slated to command the STS-134 mission of the space shuttle Endeavour — the second-to-last flight of the shuttle program — just a few months after the shooting. As Giffords made strides in her recovery, Kelly decided to take part in the mission. When Endeavour blasted off from Florida's Kennedy Space Center May 16, Giffords was in the crowd. 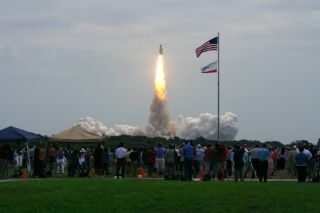 In many ways, NASA had a great year in 2011. The agency launched three different planetary missions, rendezvoused with the huge asteroid Vesta and executed a comet flyby. And NASA's Kepler space telescope discovered more than 2,000 potential alien planets. But the year also brought its share of transition and uncertainty. With the space shuttle fleet retired, NASA is now completely dependent on Russian Soyuz vehicles to ferry its astronauts to and from the International Space Station, at $63 million per seat. NASA wants American private spaceflight companies to take over this taxi service soon, but that probably won't happen until 2017 at the earliest, officials have said. NASA's budget also keeps getting trimmed, as lawmakers look to cut federal spending across the board. The agency may get just $17.4 billion in fiscal year 2012, down from $18.5 billion in 2011. The belt-tightening could threaten some of the agency's most ambitious and expensive projects, including the $8.8-billion James Webb Space Telescope (JWST). In July, the House Appropriations Committee recommended canceling the huge instrument, which is billed as the muscular successor to NASA's Hubble Space Telescope. Congress later restored funding for JWST, marking it as safe — for now. The telescope is slated to launch in October 2018. The astronauts will ride aboard a new spaceship called the Orion Multi-Purpose Crew Vehicle, which NASA announced in May. The spacecraft is based heavily on the old Orion capsule concept, which NASA began developing as part of its moon-oriented Constellation program. The Obama Administration cancelled Constellation last year in favor of the asteroid-first plan. In September, NASA revealed its Space Launch System (SLS), the $10-billion giant rocket that will lift Orion off the pad. In its early incarnations, the SLS will likely be capable of lofting 70 tons of payload, but NASA eventually wants to beef it up to carry 130 tons of material to space. Then, on Aug. 24, the unmanned Progress 44 supply ship crashed while hauling cargo to the International Space Station, doomed by a problem with the third stage of its Soyuz rocket. Russia uses a similar version of the Soyuz to launch astronauts to the space station, so manned flights were put on hold until the problem with the rocket could be identified and fixed. As a result, the orbiting lab operated with a skeleton crew of three astronauts for a stretch this autumn. Finally, the $165-million Mars moon probe Phobos-Grunt got stuck in Earth orbit shortly after its Nov. 8 launch. The spacecraft's thrusters were supposed to fire to send it on a course for the Red Planet, but they never did so. Russian President Dmitry Medvedev recently threatened heavy fines or even criminal punishment for the people responsible for this series of embarrassing failures. NASA's Mars rover Curiosity blasts off from Cape Canaveral Air Force Station in Florida on Nov. 26, 2011. NASA launched its own Mars mission Nov. 26, less than three weeks after Russia's left the pad. But unlike Phobos-Grunt, the $2.5-billion Mars Science Laboratory (MSL) mission is speeding toward the Red Planet, apparently in perfect health. The 1-ton rover carries 10 instruments to help it answer this question, including a rock-zapping laser and equipment designed to identify organic compounds — carbon-based molecules that are the building blocks of life as we know it. Several different companies made strides this year in their spacecraft development, ticking off key milestones that NASA laid out for them as a condition of continued funding. The chief contenders — firms such as Blue Origin, SpaceX, Boeing and Sierra Nevada — generally say they should be ready to fly by 2015 or 2016. During commercial operations, SpaceShipTwo will take off from Spaceport America, and this commercial facility really began taking shape in 2011. Further, scientists put money down on the research potential of suborbital spaceflight this year, buying seats on SpaceShipTwo and XCOR Aerospace's Lynx vehicle.